Posted July 6, 2015 by Heather Michet & filed under Food As Medicine, Health Tips, Recipes. It’s hot out. You’ve been playing hard or working out and feel sloggy. Go grab some watermelon and make this supreme juice. No juicer required! You’ll feel energized, cooled down and revitalized and ready to kick back in that hammock. Watermelon is rich in Vitamins A and C, electrolytes, and potassium so this is a great way to stay hydrated and keep your body chemisty in balance in hot weather. Place chunks of chilled, seedless watermelon (rinds removed) in blender. Whiz it up until smooth then drink in Vitamins A & C, electrolytes, and potassium. You just might get hooked on drinking your watermelon vs. eating it! 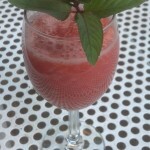 For a nice variation, add a few fresh mint leaves to the blender and blend along with watermelon. Variation #2, or in addition to either “naked” watermelon or minted version: Squeeze in some fresh lime juice after blending. Stir to incorporate flavors, then pour into serving glasses. YUM.